Acrobat’s series of comprehensive annual collections of British chart entries continues with the first half of 1957. This release fills a gap in Acrobat’s catalogue occasioned by some business machinations over the last couple of years. Musically little developed during 1957 except a deeper encroachment by Rock and Roll and a further sidelining of those artists who had ruled the charts for the past five years. There were several classic recordings that still seem as relevant and indeed popular today as they were then. To illustrate this we need look no further than 2007 when in remembrance of the 30th anniversary of Elvis Presley’s death in 1977, many of his greatest hits re entered the chart, several of which are featured here. The Everly Brothers debuted on the charts and began a reign of popularity with British audiences that lasted until their recent retirement, Jerry Lee Lewis and Chuck Berry also debuted whilst Pat Boone, Little Richard and Fats Domino consolidated their 1956 breakthroughs. For the first time there are a significant proportion of the artists still recording and performing today.British acts also continued to hold their own against the Americans, Tommy Steele, Lonnie Donegan and new rocker, Terry Dene enjoyed many weeks on the chart. 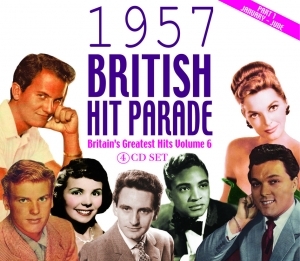 Overall though the charts kept the eclectic charm of previous years as Gracie Fields, Vera Lynn, Frankie Laine, Johnnie Ray, Winifred Atwell and many other artists retained their hit making status for yet another year. As ever, it’s an eclectic and fascinating musical mix, and quite apart from the serious collectors, just about anyone who was around at the time will want this set, along with the many contemporary music fans fascinated by the roots of rock and pop.